After teeth are extracted, the body senses that loss and begins to dissolve away the bone that used to support those teeth. 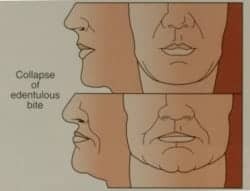 When there are no teeth in the jaw, the result is complete facial collapse after a period of ten or twenty years. This condition is illustrated on the right, with a diagram courtesy of Dr. Carl E. Misch, in the textbook Dental Implant Prosthetics. The upper lip sinks in. The lower face shrinks in height. The face develops a caved-in look with heavy facial folds, a look that we associate with old age. The functional problems, however, are the most serious. In this series of pictures, also from Dr. Misch’s textbook, the progression of bone loss is dramatically illustrated. At the top is a lower jaw with all the teeth present. 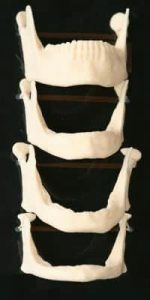 After the teeth are removed, the jawbone shrinks. The bottom picture shows how there is practically no bone left after about ten years. With the shrinking of the jawbone comes the inability to adequately retain a denture. There is very little bone left to support a denture, so the denture will slide around and fall out easily. Pressure on the ever-narrowing ridge also causes sore spots. People suffering from facial collapse may try to remedy the situation with the use of denture adhesives, but over time even that isn’t adequate. Besides the embarrassment, the inability to chew severely restricts the diet. The enjoyment of food is gone, and body health deteriorates because of the lack of adequate nutrition. Facial collapse is prevented by the presence of dental implants. A dental implant in the jawbone sends a signal to the bone which prevents the resorption of the bone around the implant. If you are already suffering from facial collapse and have become a dental cripple, unable to wear a denture, the condition can be treated with bone grafting. Please give us a call, or visit our request an appointment page, and we will be happy to examine you and tell you what can be done and how much it will cost.